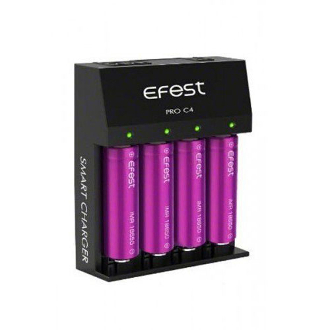 Charge your batteries with the convenient and user friendly Efest PRO C4 Charger. It is a four bay charger powered by an AC wall plug and can charge up to four batteries at the same time. When more than one battery is charging at the same time, the charging current will adjust to 1A one its own. When three or more batteries are on at the same time, the charging current will adjust automatically to 0.5A. The LED indicator light goes from red to green when the battery is fully charged. The Efest PRO C4 Charger can charge many types of lithium batteries even ones for electronic cigarettes, flashlights, electric tools, etc.